A hoof trimming chute will save your dairy time and money! The Salt Creek Hoof Trimming Chute is different than any other chute on the market today. Designed specifically for speed and efficiency, this chute is a necessary addition to any dairy cattle operation world-wide. With its unique pivoting feature, this hoof trimming chute minimizes the possibility of injury to the cow or the hoof-trimmer. As with our standard hydraulic chutes, the hoof-trimming chute firmly, but gently, squeezes the livestock. The cattle handler then slightly elevates the cow and rotates the entire squeeze mechanism 90-degrees. In this position your livestock’s hooves can be trimmed quickly and cleanly. There is no need to sling the cow. One person can operate the chute and trim hooves with speed and efficiency, minimizing livestock illness and livestock handling expenses. The unique configuration of this hoof trimming chute reduces the stress on the cattle, as it greatly decreases the time each cow is in the chute. Constructed and outfitted like our standard and Magnum chutes, all Salt Creek hydraulic chutes are built to last. The hoof- trimming chute is also long enough to preg-check through the side, with no need to get behind cattle. 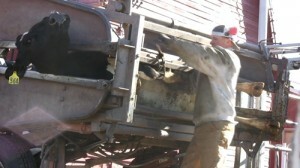 The hoof-trimming chute comes equipped with a single phase 220 Baldor 3 HP electric motor. Also standard are one full length bottom door and one split bottom door These doors are of great use when testing bulls. Every moving part on our hydraulic chutes is equipped with either a grease fitting or a steel bushing. The motor is securely rubber-mounted and rubber bumpers have been installed for noise reduction. The portable version of the hoof-trimming chute is the perfect solution for professional hoof-trimmers. In this configuration, the hydraulic chute comes with our wishbone style trailer. This unique design allows one man, or woman, to easily move the chute into position. A 3,000 lb hydraulic chute can be attached to the trailer and on the road in less than five minutes. Our trailer also tows very easily and smoothly. This simple and quick setup brings tremendous flexibility to your cattle handling operation.